Yesterday I waited for a window and shutter to turn up at the Art Dept so that Chris and I could assess the quality. The window and shutter had been made under the supervision of Fozan with a reluctance to involve either the UK designer or art director. Unfortunately, the design bares very little resemblance to the drawings that Fozan had been supplied with, and the quality of work was terrible. This is not entirely surprising, given that Fozan never takes drawings with him, but instead insists that he can get the work done by describing it to contractors. In this case, the window was too thick, it was full of studs that made it look a mediaeval cliche (it seems that Jordanian carpenters use studs all the time when manufacturing period pieces – regardless of whether it is appropriate for the design – to hide screw heads). The window and shutter were also the wrong colour, cut poorly, and the window had no glass despite this being an essential part of the assessment process. When I asked Fozan where the glass would go, he told me it would be stuck to the back of the window. Hmmmmm…. Yesterday was just one instance amongst many where our department has waited for items to arrive only to find out that they have gone to Ibrahim’s office instead. The question is, who is responsible? Is Fozan telling Ibrahim what is going on and Ibrahim is demanding that the items to be sent to his office? Or is Fozan ignoring our directions – despite his working for us – and having them sent to Ibrahim’s office instead? If the former, Fozan is disrespecting our department. If the latter, Ibrahim is disrespecting our department. Either way, it is unprofessional, disrespectful, naive that they think they should know better, and a waste of everyone’s time. 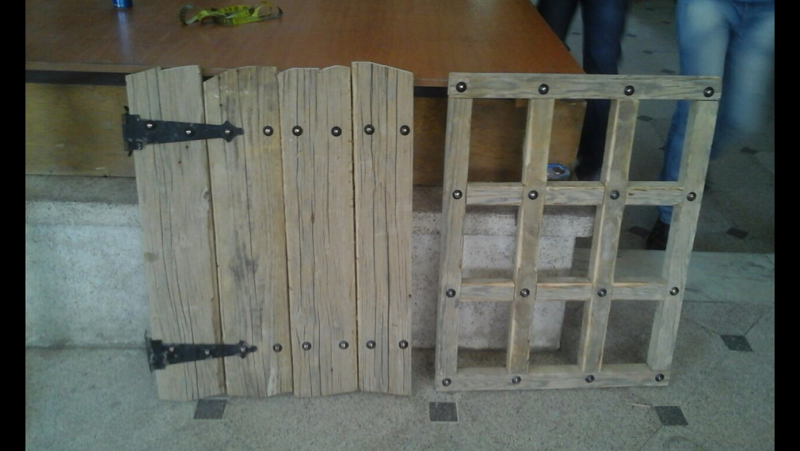 This entry was posted in Construction and tagged fozan, ibrahim, witch's shutter, witch's window. Bookmark the permalink. What Do You Get When You Combine An Art Dept With ATP? In hindsight I can see that Fozan was merely doing as he had been told. As stated elsewhere, I grew very fond of Fozan. Proud, he may be, but he is not a bad man. I have a lot of respect and fondness for him now.